Rosin weed. Native. Perennial. Propagates by seeds. Time of bloom: July to September. Seed-time: August to October. Range: Michigan to the Dakotas, southward to Alabama, Louisiana, and Texas. Habitat: Prairies; fields, meadows, and pastures. Many a traveler of the pioneer, roadless days of "going west" found this plant a very serviceable compass, for its large leaves are held nearly erect with their edges directed north and south. It is a vigorous, grossly feeding weed, with large, thick, deep-boring roots which yearly send up huge tufts of stout stems, four to twelve feet tall, bristly-rough, and sticky with resinous juices. 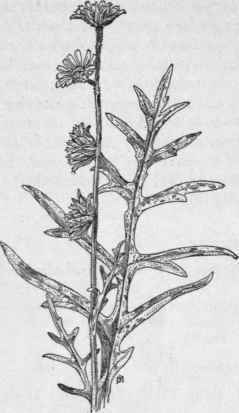 Leaves alternate, a foot or more long, also bristly-rough on both sides, oblong, pinnately divided, the segments narrow, pointed, sometimes cut-lobed or pinnatifid, rarely entire; petioles long, rather stout, with dilated and clasping base. Heads three to five inches broad and very showy, sessile or with very short peduncle. Fig. 312. - Compass Plant (Silphium laciniatum). X 1/8. Cultivation of the ground is the best method of suppression; but if not desirable to break up the meadows where the plant is most troublesome, it should be cut deeply, below the crown, with a sharp hoe or spud, before the first flowers mature, the roots being salted so as to check new growth.